LONDON -- Britain's biggest automaker Jaguar Land Rover is grappling with a fresh Brexit dilemma over the supply of parts to it UK plants. JLR wants to boost the proportion of parts made in the UK to simplify its supply chains and capture cost-saving economies of scale -- but the looming split from the European Union is making it tougher to persuade component makers to expand in the country. The Coventry, England-based company has been pursuing so-called onshoring for several years after a surge in British auto-sales volumes made it viable for suppliers to boost their footprint. Brexit has made the process harder -- just as it becomes more pressing amid concern that the schism could herald import duties and extra customs checks. Suppliers are holding off on adding capacity in the UK, JLR purchasing director Dave Allen said last month before his retirement. With the risk of tariffs in a no-deal Brexit, "Why would they invest?" JLR is not alone in wanting to encourage domestic manufacturing of everything from bumpers to seat parts. British car production hit a 17-year high of 1.7 million autos in 2016, making the country Europe's No. 3 manufacturer. This is spurring automakers to seek a greater proportion of local supply for UK plants, according to Mike Hawes, head of the Society of Motor Manufacturers and Traders industry group. Brexit has encouraged the process, with 64 percent of automakers in England and Wales saying in the aftermath of the 2016 referendum that they planned to bring some manufacturing back to the UK by the time of the split, according to a Lloyds Bank survey. That was up from 58 percent a year earlier. With many components re-exported and imported again several times during the manufacturing process, it's not hard to see why, since each border crossing could incur tariffs in the absence of a trade deal. Even with an agreement, so-called "rules of origin" are likely to compel firms to bring more of their supply chains to the UK EU trade pacts with other countries generally require exporters to prove that 50 to 60 percent of a product is from the originating country. Continental suppliers already have a skilled workforce and volume savings, so JLR would inevitably have to pay more per item for 50,000 parts made in the UK than for a million in Poland. But it could still be worth it to help manage the risk, says Allen. JLR CEO Ralf Speth this month told Prime Minister Theresa May that a bad Brexit deal could put tens of thousands of jobs at risk and cost the company -- which builds 3,000 cars a day using 25 million components -- more than 1.2 billion pounds a year. 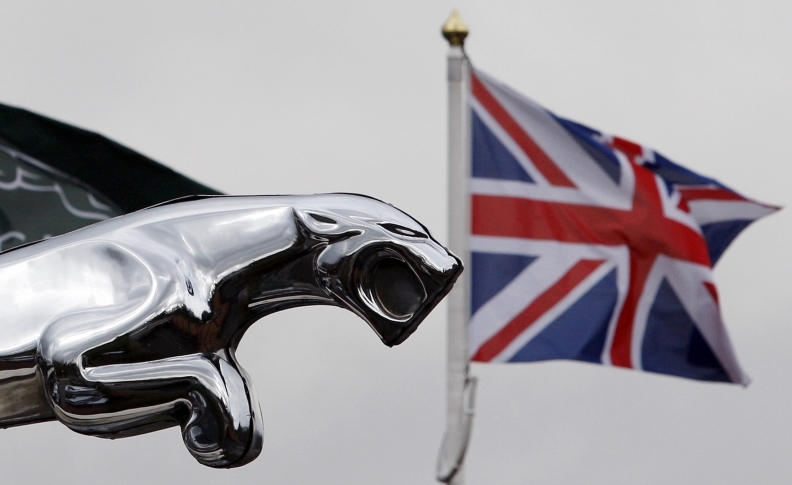 JLR on Monday said it would cut Jaguar production at its Castle Bromwich site, citing "headwinds" in the industry. The company currently imports about 40 percent by value of components from mainland Europe used in its four UK assembly and engine plants. Across the British auto sector, some 44 percent of parts are locally made, according to 2017 research for the Automotive Council, a group of industry and government representatives. While that is up from 36 percent in 2011, the proportion of home-grown content remains higher in continental Europe, possibly reaching 60 percent in Germany and France. Concerns about Brexit are not the only barriers to building a bigger UK components industry. Labor costs are also a significant obstacle -- while some products could be manufactured competitively in the UK, shifting others would only make sense in the event of significant tariffs. Applied Component Technology, which makes parts for car interiors, said access to source raw materials in the UK is also a significant factor. Chief Commercial Officer Dermot Sterne said in an interview that the manufacture of granules for moldings and chemicals for polymer components -- accounting for two-thirds of the finished product -- is mostly done in the EU. Brian Connell, a supply-chain consultant at KPMG, said many companies will ultimately defer a decision on boosting UK production until the nature of the Brexit settlement is known. That is especially true of businesses that might need to export some items to continental Europe, raising the prospect of them having to pay the same tariffs British automakers are seeking to avoid. "It's very difficult to make a big investment decision around UK manufacturing," he said. "It's a risky location."